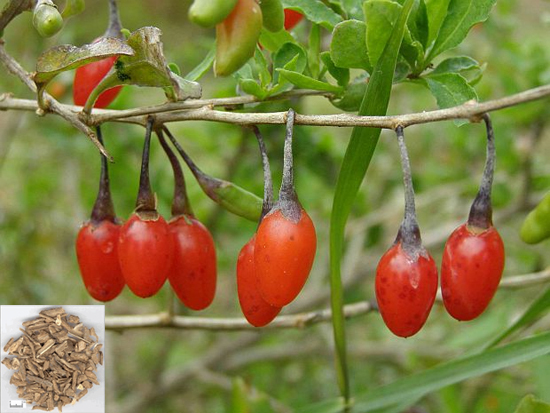 Common Name: Wolfberry bark, Lycium bark, Chinese wolfberry root bark. Properties & Taste: Sweet or tasteless and cold. Functions: 1. To cool blood; 2. To clear heat in the lungs. 1. Heat in the blood and deficient yin manifested as afternoon fever and night sweating. Wolfberry bark (Digupi) is used with Anemarrhena rhizome (Zhimu) and Turtle shell (Biejia). 2. Heat in the lungs and deficient yin manifested as cough, asthma and cough with blood. Wolfberry bark (Digupi) is used with Imperata rhizome (Baimaogen) and Biota tops (Cebaiye). 3. For bleeding due to invasion of the Blood by Heat with hematemesis and epistaxis, it is used with Rhizoma Imperatae (Bai Mao Gen) and Cacumen Platycladi (Ce Bai Ye). Dosage: 6-15 g, decocted in water for an oral dose. Cautions & Contraindications: Contraindicated in patients with fever induced by Wind Cold and with diarrhea due to Spleen Deficiency.